Obviously problems with attention span. The illegal excavation and trade of cultural objects from Syrian archaeological sites worsened markedly after the outbreak of civil disturbance and conflict in 2011. 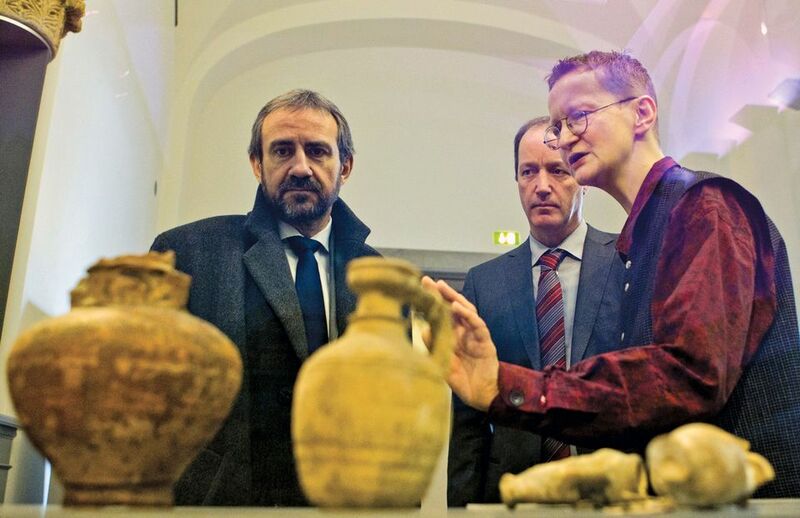 Since then, the damage to archaeological heritage has been well documented, and the issue of terrorist funding explored, but hardly any research has been conducted into the organization and operation of theft and trafficking of cultural objects inside Syria. As a first step in that direction, this paper presents texts of interviews with seven people resident in Syria who have first-hand knowledge of the trade, and uses information they provided to suggest a model of socioeconomic organization of the Syrian war economy regarding the trafficking of cultural objects. It highlights the importance of coins and other small objects for trade, and concludes by considering what lessons might be drawn from this model to improve presently established public policy. A really important, careful and reflective piece of work based on the view from the ground. Coins figure prominently, it seems looters are primarily looking for coins, which sell for decent money and are easy to smuggle (as Christopher Jones notes: 'portability and plausible deniability about the source of an artifact seem to be important'). So shall we see a statement from the leading numismatic associations about this text apart from their weedy 'metal detectors (sic) in Syria should be controlled'? The UNESCO Courier has just published Sam Hardy's article on “curbing the spoils of war“ (Hardy, S A. 2017: “Curbing the spoils of war”. UNESCO Courier, Number 3). Confronted with such evidence [of conflict antiquities trafficking, around the world, over more than a century], it becomes impossible to maintain the reassuring myths that conflict financing through antiquities trafficking is not happening at all, that it is not making a difference to the development of those conflicts or that it can be suppressed with exceptional measures against particular organizations. The only way to constrict this kind of trafficking is through the policing and regulation of the conflict antiquities market. Hear hear. And you'd think that reputable dealers worthy of the name would be going for it ... and what is the antiquities trade doing, bless them? 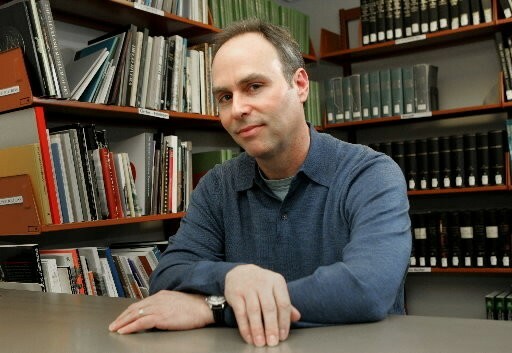 Now that Michael Bennett is leaving the Cleveland Museum of Art (Steven Litt, Curator who defended purchase of Apollo bronze leaves Cleveland Museum of Art for Florida job The Plain Dealer Feb 24th 2018), they are looking for a replacement. The Cleveland museum said in its online job posting for the antiquities job that it "seeks a highly motivated individual to oversee the display, interpretation, and growth of the museum's collection of ancient western art," a collection of over 1,100 works that includes art from the ancient Near East, ancient Egypt, Greece, Etruria and Rome. 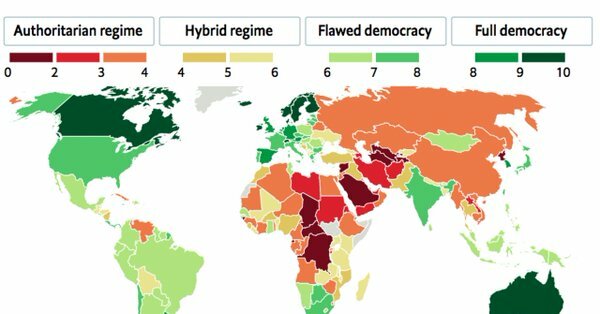 It's a bit odd though that all the countries mentioned as sources of their 'western art' actually lie to the east of Donald Trump's increasingly isolationist US. Would candidates who have an interest in and experience with, for example, Pueblo art 'be particularly appealing' too? Bennett stirred controversy among art historians and archaeologists over the museum's 2004 purchase of the "Apollo Sauroktonos," or "Apollo the Lizard Slayer," now known as "Apollo the Python-Slayer." Leading archaeologists and art historians opposed the purchase because the sculpture's provenance, or ownership history, could not be backed up with hard evidence [...] Although it lacked such proof, the museum said in 2004 that scientific analysis showed the sculpture had been out of the ground for at least a century and could not have been looted in violation of the UNESCO convention. Bennett also, as far as I know, did not address the issue of the Romanian professor who was the quoted eye-witness who said she first saw the Apollo lying on a shed floor in pieces on a visit to Leutwitz - yet this conflicts with her own previously published account where she said she saw it being worked on in a restorer's workshop. Just for those who missed it the first time around, here are my posts posing a few questions Cleveland Museum should be answering about Mr Bennett's purchase and the way he dealt with sceptical enquiry (Friday Retrospect: The First Sighting of the "Leutwitz Apollo" PACHI Friday, 1 August 2014 ). There the importance of the isotopes and the Marinescu account are fully discussed. Litt goes on to discuss other dodgy antiquities matters in which Cleveland Museum of Art was involved, some of it in Bennett's tenure. This includes the knocked-off head of a statue of Drusus Minor bought in 2012 which they'd believed had come from a collection in Algeria. In fact there was photographic evidence that it had been excavated in Sessa Aurunca near Naples in 1926 and stolen from the local museum in 1944 by occupying troops after defeat of the Nazis (see my post here). There Robert, sixty dollars. 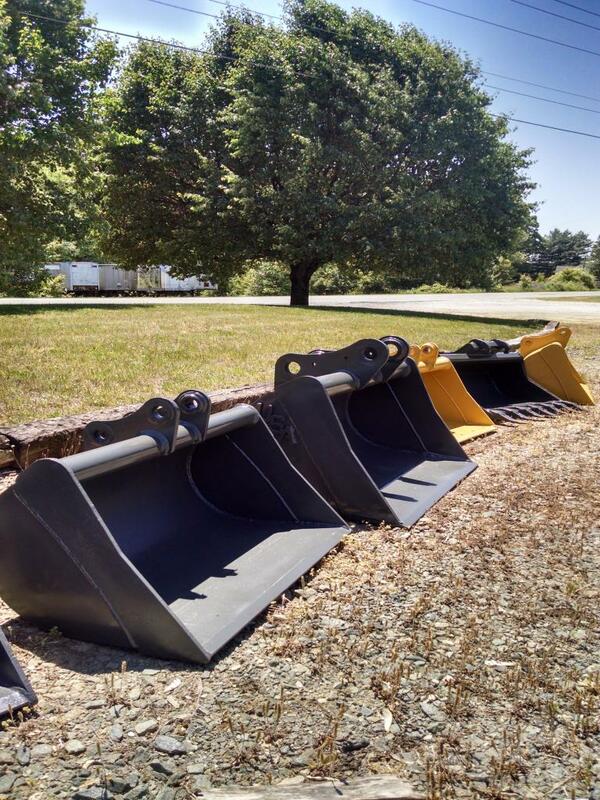 In England, that'd be thirty for the landowner, thirty for you, no? And if you were not going to sell it, you'd still owe the landowner thirty dollars for their share. But you are not in England are you? Hoik it Out: 'Best Practice' for 'Citizen Archyologists'. what on earth did this lot say to convince that farmer it was OK? please, before you let anyone onto your land, watch how they walk. And talk. Of course the effective-as-a-wet-paper-bag PAS could jolly well pull their Bloomsbury corporate fingers out and (as part of that 'outreach' they claim so earnestly to be doing) inform the public and landowners that not even 'citizen' archaeologists excavate sensitive findspots with a socking big ditching bucket. Fat chance of that, hey? We note that 'not-using-ditching-buckets' is not one of the headings in their pretty pathetic twenty-years-on 'Code of Responsible Metal Detecting in Bonkers Britain' written at not inconsiderable public expense. If it's not there, then I guess the PAS consider this to be 'best archaeological practice', innit? 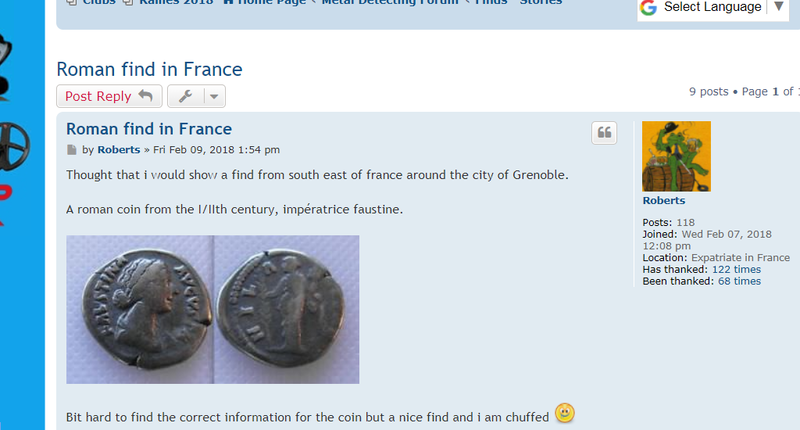 With regard to the effective-as-a-wet-paper-bag PAS 'pseudo-outreach' on 'best practice artefact hunting', Nigel Swift has just pointed out to me that the detectorist in question has already spoken to the FLO but is still going to dig deep.. well, best practice is 'volutry innit'? But is PAS going to speak out? Don't hold your breath. Levin purchased the Cybele in 1987 at a public auction in Israel. 12. The public auction was held by Matsa Co. Ltd (“Matsa”), an Israeli auction house founded in 1970, and the Archaeological Center in Israel, which was founded in 1979 and licensed by the Israel Antiquities Authority (“IAA”) to sell antiquities. 13. From October 29 to November 2, 1987, Matsa and the Archaeological Center exhibited the Cybele at Beit Asia, 4 Weizmann St., Tel Aviv, Israel. 14. On November 3, 1987, at the same location as the exhibition, Matsa and the Archaeological Center held a public auction that included the Cybele. 15. 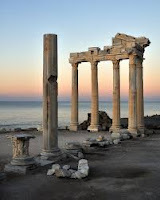 The auction catalogue bears the seal of the Antiquities Dealers Association, an association that aims to “protect [ ] honest collectors and the legitimate trade in antiquities from being tainted by those who operate illegally.” See http://theada.co.uk/. The argument is apparently being made that the 'reputation' of the dealers makes any verification by the buyer of their good title superfluous. But in fact this is irrelevant, No mention is made of any actual documentation that the object really had come from the Dayan collection. Dayan died 16 October 1981 and a 2003 article talks of his involvement in antiquities smuggling and, more importantly, the public debate in Israel about Dayan’s illicit digging after the display of his collection in the Israel Museum in Jerusalem in April 1985 (op. cit. p33). How can this be a 'good faith' purchase of an undocumented item from part of his collection not much more than a year later? Matsa C. Ltd (apart from being a mining company) is listed here as 'small general' (which may have a bearing on the question of whether they in fact specialise in the sale of 'property of the kind of the thing sold' -first century Roman sculptures from Turkey - see below) and they seem to be in some mysterious way to be linked with 'Robert Deutsch, Archaeological Center. Ancient Coins and Antiquities'. As additional justification of his claim, Levin cites that the statue was exhibited at the Eretz Israel Museum 20 years ago in Tel Aviv, and 'three Israeli agencies sponsored the exhibit, which was shown inside one of the country’s largest museums'. Levin for some reason loaned it to the museum for display in 1992. When it ceased to be on display and where it went after that is not given n the court documents. The Museum had a responsibility to ensure that it was not showing illicitly-obtained items, that it failed to document that it had not done so can in no way be used in a US trial as evidence of licitness . In 'early 2016', the item was consigned to an unnamed auction house in Tel Aviv, and here's where it becomes complicated. The auction house for some reason decided to send it to New York for auction and immediately (?) applied for an export licence. The licence was received on Tuesday 23rd February 2016, and the very next day the statue was on its way to New York, while just a few days later, on or about Tuesday March 1st, 2016, IAA was notified by Interpol that Turkey suspected that the Cybele was taken out of Turkey illegally. The artefact had been exported just in the nick of time before that notification. 'Phew', eh? How can the IAA explain that? The two (?) auction houses involved in this transfer of location are not named The sale was stopped on or about 16th April 2016 on notifiocation that the object may have left Turkey in an illicit manner. Where any movable property is sold by a person who carries on the sale of property of the kind of the thing sold, and the sale is made in the ordinary course of his business, ownership passes to the buyer free of every charge, attachment or other right in the thing sold even if the seller is not the owner thereof or is not entitled to transfer it as aforesaid, provided that the buyer buys and takes possession of it in good faith. In other words if you buy something, anything, dodgy from a dealer that habitually sells such stuff, in Israel, 'they can't touch you for it'? There is some weird Talmudic logic here, in effect anything goes, you can buy what you want as long as the dealer selling the stuff is not prevented from selling it by being locked up in jail. And he cannot be convicted on selling dodgy stuff to people because he is not in jail. Loopy. How about getting them for fraud, representing their goods to unsuspecting potential buyers as something they are not? It will be interesting to see what 'good faith' means in the case of an artefact showing it had come from Side and with no papers to show it entered the Dayan collection legally. Can one buy paperless antiquities in 'good faith' from a collection that is well-known to have contained illicit material, as opposed to those where paperwork is provided to show legal origins? Levin and his lawyers assert that 'there is no basis for the forfeiture of the Cybele under the UNESCO Convention and the [C]CPIA'. Maybe so, but that merely shows how inadequate the US's CCPIA really is. 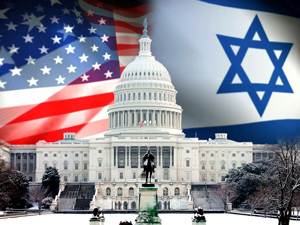 They also assert that 'Turkey has no right of ownership in the Cybele in light of Levin’s ownership and clear title to the Cybele pursuant to Israeli law'. But the item is not now in Israel. Note how US collectors moan like anything about their government 'respecting foreign laws' when it means they cannot hang on to some illegally exported loot, but are silent about the same phenomenon when it seems to imply that they can. If the item is legally held in Israel, let it be returned for sale in Israel now that Turketyy has laid a claim on it, , and we will see what their law allows and does not. Eleni Chrepa and Slav Okov , 'Inside the Bitter Dispute Over the Name ‘Macedonia’ ...', . Bloomberg 22 Feb 2018. A dispute between Greece and the Republic of Macedonia goes back more than seven decades, but now both neighbors have a political interest in finding a solution. 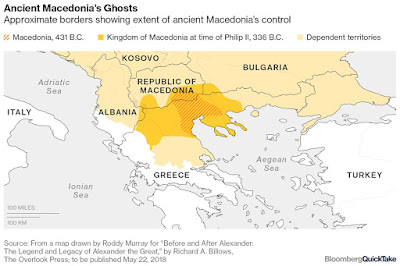 The row isn’t over territory or where the border should be, it’s about what constitutes "Macedonia," the name taken by the small independent state that was born out of the breakup of Yugoslavia. Greece says the name Macedonia should refer only to its northern region, which was Alexander the Great’s stronghold in ancient times, and today is split into eastern, western and central administrative divisions. To Greece, Macedonia, historically and culturally, has nothing to do with any other country, including the republic to its immediate north. and in some states the pre-Colonial material culture is displayed in Natural History museums next to stuffed birds and butterflies. US Supreme Court rules 8-0 that the Persepolis texts cannot be seized and sold in order to pay a civil judgement against the government of Iran for sponsoring terrorism. Only in America, I feel, would anyone think they 'could'. Under Secretary of State for Public Diplomacy and Public Affairs I. Steven Goldstein and Libyan Ministry of Foreign Affairs Under Secretary for Political Affairs Lutfi Almughrabi will sign a landmark bilateral Memorandum of Understanding on cultural property protection on February 23, 2018 at 2:00 p.m. at the U.S. Department of State. As part of the ongoing cooperation between the United States and Libya’s Government of National Accord, the United States will impose import restrictions on categories of archaeological material representing Libya’s cultural heritage dating from 12,000 B.C. through 1750 A.D. and Ottoman ethnological material from Libya dating from 1551 to 1911 A.D. Restrictions are intended to reduce the incentive for pillage and trafficking and are among the many ways the United States is combatting the financing of terrorism and disrupting the global market in illegal antiquities. These restrictions continue similar restrictions implemented by the U.S. government on an emergency basis on December 5, 2017. The cultural property agreement negotiated by the State Department under the U.S. law implementing the 1970 UNESCO Convention on the Means of Prohibiting and Preventing the Illicit Import, Export and Transfer of Ownership of Cultural Property underscores the United States’ commitment to our relationship with Libya, as well as our global commitment to cultural heritage protection and preservation. The United States now has similar bilateral agreements with 17 countries around the world, as well as emergency import restrictions on cultural property from Iraq and Syria. 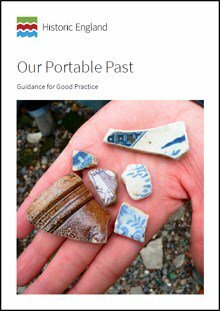 This statement sets out Historic England’s approach to surface-collected portable antiquities in the context of our own archaeological projects. Historic England also recommends the statement as a suitable model to follow for organisations that fund or authorise archaeological projects, and for land managers and individuals involved in giving consent for archaeological projects whatever the legal status of the site or sites involved. 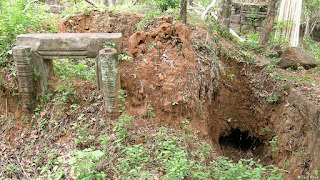 It is also statement of good practice for portable antiquities/surface collected material in the context of field archaeology and survey programmes (including the use of metal detectors). Note that the text does not say the holding of commercial collection-driven exploitation rallies is problem in itself, just if the looted objects disappear. I've been blogging about it for years, now to put it all together in a short talk and then see what emerges from the discussion. Regular readers will know that I started off as a supporter of the 'antiquities finance terrorism, so we need to regulate the trade' model. Then I began to have questions, and then doubts (and not just about what we mean by that word 'terrorism')... I should acknowledge that Donna Yates (as I understand what she was writing) held all along that the evidence was not really there, and Sam Hardy has been assiduous in busting the myths and deconstructing glib narratives. Other colleagues have been just as staunch upholding them. Antiquities dealers and collectors are in total denial. The issue emerges as one of considerable complexity, and the debate about 'what it all means' will no doubt go on for years. Butas the terrible war in Syria and that in Iraq seem, sadly, to be entering another phase, perhaps it is time to take stock of what we know, what we think we know (but maybe don't), what we do not know but wish we did, and what we will probably never know (and yes, I do plan to cite Donald Rumsfeld). I use the term Middle East in the title, but cannot fail to mention both Libya, Afghanistan and Yemen, all outside the area as usually defined, but the way it is shaping up at the moment, the focus will be on what is happening right now in Syria and Iraq and how we should be reacting to it. And yes, I still believe that the antiquities trade needs regulating, no retractions there. Lobbyists for the US antiquities trade demand that when the US signs an MOU aiming to curb the entry of smuggled artefacts into the USA that it is made conditional on the partner countries allowing more artefacts into the USA on loan to public collections. A recent story illustrates why some of them might be reluctant to do so. 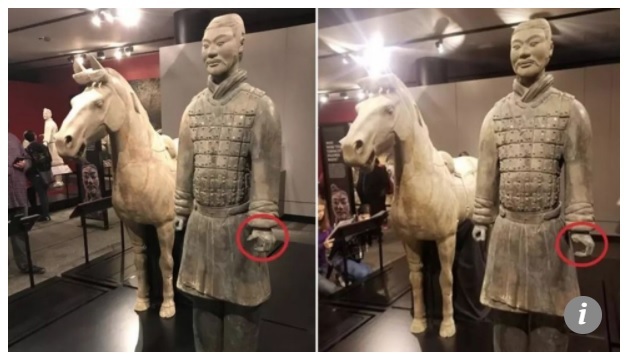 Chinese authorities are calling for a heavy punishment for an American man charged with stealing a thumb from an ancient terracotta warrior statue on display at a museum in Pennsylvania. They have also demanded compensation for the damage caused to the US$4.5 million relic (Kinling Lo, 'China urges US to get tough on man who stole thumb from US$4.5 million terracotta warrior on display in a Philadelphia museum' South China Morning Post , 18 February, 2018). The Franklin Institute in Philadelphia had borrowed ten statues from the Shaanxi Cultural Heritage Promotion Centre. They have been on show in Philadelphia since September, and are part of a clay army of about 8,000 soldiers, charioteers and horses unearthed in Xian, capital of northwestern China’s Shaanxi province in the tomb of China’s first emperor Qin Shihuang (210-209BC). According to figures from the FBI, they are potentially worth US$4.5 million apiece. Michael Rohana, 24, was charged earlier this month with breaking off and stealing the left thumb of the 2,000-year-old sculpture [...] on December 21. [...] Rohana, who comes from the US state of Delaware, was attending an ugly Christmas jumper party at the museum when he and two associates managed to make their way into the “Terracotta Warriors of the First Emperor” exhibition, the door to which was unlocked, the Beijing Youth Daily report said. According to surveillance camera footage, after the two other party guests had left the room, Rohana took a selfie with his arm draped over the shoulder of one of the statues. He then snapped off one of its thumbs, put it in his pocket and left. The theft went unnoticed until January 8, at which time the museum sought help from the FBI’s art crime team, who traced Rohana to his home on January 13. He was subsequently charged with the theft and concealment of a major artwork, and released on bail. The cultural centre said it had loaned its exhibits more than 260 times to 60 different countries over the past 40 years, but had never before experienced “such a noxious incident”, according to the newspaper report. One also wonders about a museum's fake security which means that three people could be where they were not supposed to be (what, no alarms in your galleries Philadelphia?) and this was not detected for 18 days? This was on a day when there were people in the galleries (?) holding an 'ugly jumper party'? What kind of dumbdown 'museum event' is that? And the door to the closed gallery was unlocked? Why? PAS Database Down: British Museum Unable to Curate Finds Data Unaided? This raises a question, what mechanisms are in place to ensure that the PASD is actually a permanent record accessible to the public? 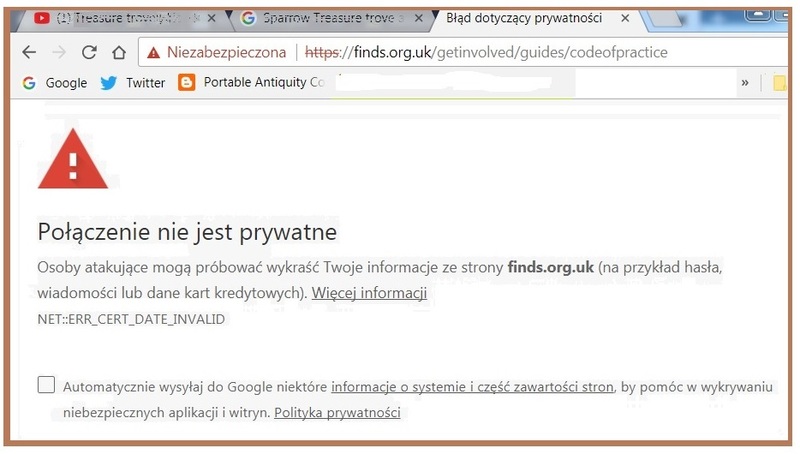 As loss of evidence from the archaeological record gathers pace, how will that Database keep up and how will access of the public stakeholders to the information about what private individuals have taken away be maintained in the future? What will happen when the database instead of a source of institutional pride becomes a liability? The BM has scored a massive fail in firing the person whose creativity and input made the database possible, how are they going to ensure its maintenance when they cannot even get a simple thing like this right? The PAS has been informed, let us see how quickly proper access is restored, and then let us see how long it is before there is another breakdown. 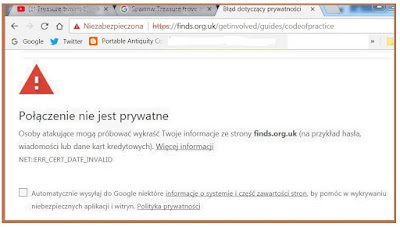 The owner of finds.org.uk has configured their web site improperly. To protect your information from being stolen, Firefox has not connected to this web site. A new report out reveals the dire situation of museums in the UK (Art Fund and Wolfson Foundation publish Why Collect?, a report on museum collecting in the UK, Art Fund 15 February 2018). In the report, which calls for increased investment in museums and their collections, its principle author, historian Sir David Cannadine highlights a 13% fall in public spending on museums and galleries in England from 2007 to 2017, the imbalance of funding for museums inside and outside London, the poor salaries in the sector and the pressures faced by the Heritage Lottery Fund because of declining National Lottery income. The report highlights the ever-widening gap between the spiralling prices of works on the international art market and the limited acquisition funds available to museums and galleries in the UK. It calls for increased investment in museums and their collections, as public spending on museums has decreased by 13% in real terms over the last decade. It is, writes Cannadine, a report that 'instead of giving comfort and reassurance, expresses anxiety and concern.' Cannadine's analysis of museum and gallery collecting traces its history from the 1830s to the present day and is accompanied by 11 case studies which explore various facets of the social and cultural impact of collecting. This is supported by statistical evidence from a national survey involving 266 collecting institutions. The report was undertaken to address the question of how, why and on what scale publicly funded museums and galleries continue to expand their collections. 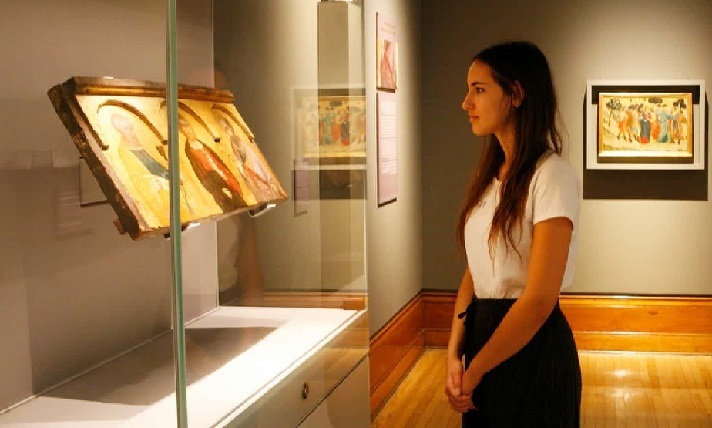 - The digital revolution has enabled entire collections to be accessed and viewed online and ‘the more that we can learn about collections from exploring them online, the more we are likely to want to go and visit them in situ’. - Only half of the 266 UK museums and galleries surveyed, had a specific budget allocation for collecting, and in most cases it was rarely more than 1% of the overall amount that was spent. Although almost all of the respondents had been able to add objects to their collections over the last five years, gifts and bequests were the most frequently used methods. The survey results demonstrated that, except in the case of the national museums, collecting for most museums and galleries is no more than a marginal activity. Within four months of valuation the funds for the joint purchase had been raised, and the Hoard was formally acquired in June 2010. A public fundraising campaign led by Art Fund raised £900,000, the largest amount ever given by the public to a heritage appeal; a third of donors were from the West Midlands, indicating the regional pride felt for the endeavour. Support also came from the National Heritage Memorial Fund (£1.285m) and Art Fund with the support of the Wolfson Foundation (£300,000), with a further £600,000 from trusts and foundations, £100,000 from Birmingham City Council, £100,000 from Stoke-on-Trent City Council, £80,000 from Staffordshire County Council, £20,000 from Lichfield District Council and £20,000 from Tamworth Borough Council. Obviously the few dozen cases (assiduously chronicled by Bloomsbury's Treasure Registrar to create a rosy picture of their 'partners', the Treasure hunters) is just a drop in the bottomless bucket of funds-gobbling treasure hunters, taking money from the purchase of other items. One of the shipments sent from the United Kingdom had been manifested as having a value of $252,000. Upon opening the wooden cargo container, what appeared to be a helmet was discovered. The item appeared to be an antique possibly dating back to ancient times. The shipment documentation appeared incomplete and similar items have been deemed authentic and repatriated in the past. An expert appraiser was consulted and determined the item to be an authentic "Corinthian Helmet" dating back to 100-500 B.C. CBP agriculture specialists at Miami International Airport selected the second shipment sent from El Salvador for an agriculture examination and discovered 13 individual pieces of pottery and figurines. The shipment manifest listed the contents as "Handicrafts". The items appeared to be pre-Columbian and CBP detained the shipment for appraisal and authentication. 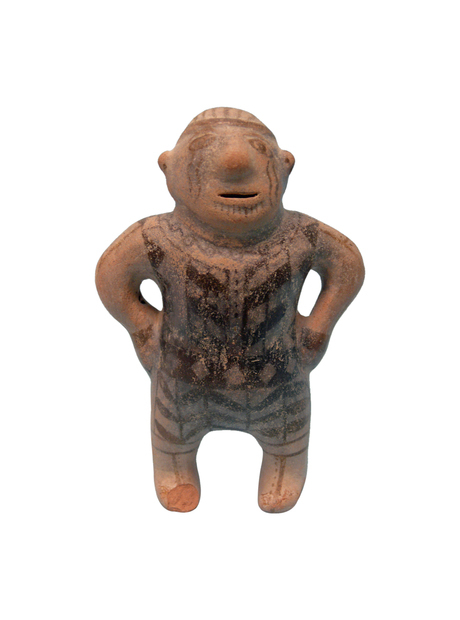 An expert appraiser recently concluded the items are of Mayan origin. Some of the items date back to 300 A.D. while others date back to 1200 A.D. "
CBP's primary mission is to stop terrorists and their weapons from entering the homeland and the agency [...] “The interception of these ancient antiquities is a great example of the role CBP plays in enforcing international repatriation laws of ancient artifacts." What 'laws' would they be then? Again that US fixation on the R-word, repatriation. Its Smuggling you guys are there to fight. Iraq has foiled an attempt to smuggle antiquities worth millions of dollars to Turkey, its interior ministry said on Saturday. 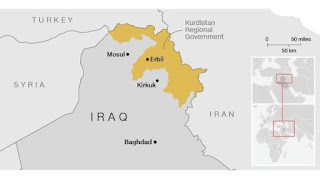 The ministry’s general inspector said in a statement, quoted by Alforatnews, that ministry teams in Kirkuk blocked the transfer of scriptures and antiquities worth USD13 million to Turkey, which were in the possession of two people. Those, the statement revealed, included scriptures and a bust. It added that the suspects confessed to agreeing with another party in Turkey on the handover of the pieces. They said they were also expecting to receive more items while waiting at the Turkish borders, including jewelry belonging to the wife of late president Saddam Hussein worth millions of dollars. Russia interferes with US elections, US has ambitions to interfere with everything else, including how distant sovereign states look after their own heritage. Artefact collectors tend to think they have a 'right' to buy whatever they want, but some countries draw firm lines about what can be brought within their national borders. In the latest of recent confiscations of such items in the country, Argentinian police have seized a package containing objects adorned with Nazi symbols sent from the USA to the northwestern Argentine province of Salta (Luc Cohen, 'Argentina seizes package of objects adorned with Nazi symbols' UK Business Insider/Reuters Feb. 14, 2018). Police raided the home of the individual who picked up the package from a post office, the Ministry said, adding that the person was cooperating with authorities. "There is no room in Argentina for these types of expressions, which make reference to a tragic era in human history," Security Minister Patricia Bullrich said in the statement. [...] Last June, police seized a cache of Nazi artifacts hidden behind a library in the house of an art collector in Buenos Aires. Vignette: Nationalist ideologies can lead to extremism and dehumanisation and need to be contested wherever they occur. We need a publication of standards, and mandate a certain level of training. When there are near-misses it should be reported, anonymised and circulated so others can learn from it.” Radcliffe said the industry should take the lead. He criticised the existing associations in the art world and said they have conflicts of interest because they represent their members and try to regulate them. [...] Radcliffe warned that if standards do not improve further the art market will “lose the ability to influence government”. Also on the panel of speakers, art consultant Sara Pearce warned: “We should police ourselves, otherwise outsiders will who do not understand the subtleties of the art market.” I really do not share the optimism that the UK 'can' led on this, it has done precious little to justify the optimism. Neither fdo I see anything is gained by not naming and shaming those guilty of the sub-standard deeds euphemised as 'near misses'. Yes, certain sectors of the art market should now lose the ability to influence government. Other arrests have taken place recently. At the beginning of November, police in Caras-Severin county announced the seizure of about 5,000 artifacts including more than 300 ancient and medieval coins. Other artefacts in private possessions were seized before the people could sell them on to no-questions-asked buyers, such as a unique gold bracelet seized by police from a 27-year-old man in Olt County in southern Romania (reported when the man tried to sell it in a pawn shop) and collection-quality coins from Hunedoara county worth about1,500 euro. Obviously the message is that if you are buying artefacts of this nature a responsible collector should by rights have to have access to the paperwork proving the seller obtained the items from a licit source and actually has legal title to them. 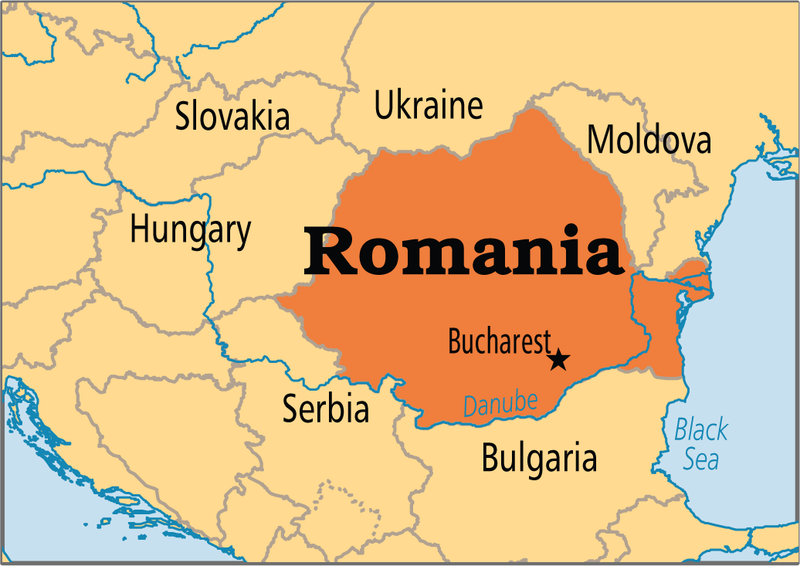 Somehow Mr Giedroyć seems to have forgotten to put that in his article merely noting that in Romania 'The local policy appears to be that you are guilty until proven innocent', which is indisputably the case if you are caught red-handed with state property in your possession. What is so difficult to understand in that? The American Committee for Cultural Policy have a new conspiracy theory, this one is a real cracker: 'Tangled Interests With State Department, ICOM Emergency Red Lists May Serve Other Goals' ('Yemen Claims Jewish Religious Artifacts). Whoah, tinfoil helmets out everyone. This is about the new Emergency Red List for Yemen (January 2018) which has made the no-questions-asked market a bit leery. And of course, it being America, the Jews are involved. For the ACCP this is not at all about the heritage of the territory of Yemen, but part on an anti-Jewish conspiracy, Readers may remember the fuss the same group of people kicked up about the so-called Iraqi Jewish Archive a while ago. Now it is Yemeni Jewish Collectables they are on about. The Yemen Red List has raised extreme concerns among the broader Jewish community, and especially among exiled Jews from the Middle East. Yemen is just the latest nation to assert its government’s ownership and control over the heritage of Jewish peoples that were persecuted and driven to leave en masse in the mid-20th century, after the partition of Palestine and creation of a Jewish state in 1947. Iraq, Syria, Egypt, and Libya have already laid claim to all of their former Jewish population’s heritage. 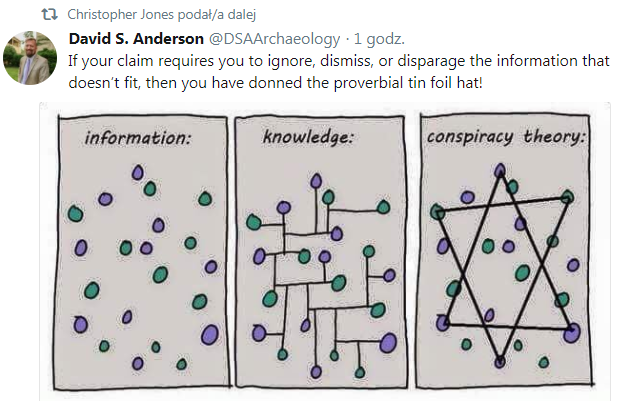 Yet the Department of State has long held to the position that people do not have legitimate claims to their history or their art; only governments have claims to art and history. [...] There is no acknowledgement of legitimate private or community ownership, even in the case of heritage belonging to exiled peoples. That is because we live in a world in which human communities are currently organized into states. When the anarchists (or Leninists) get their wish, then there would be no states, and no state oppression of the rights of individuals to do as they wish. 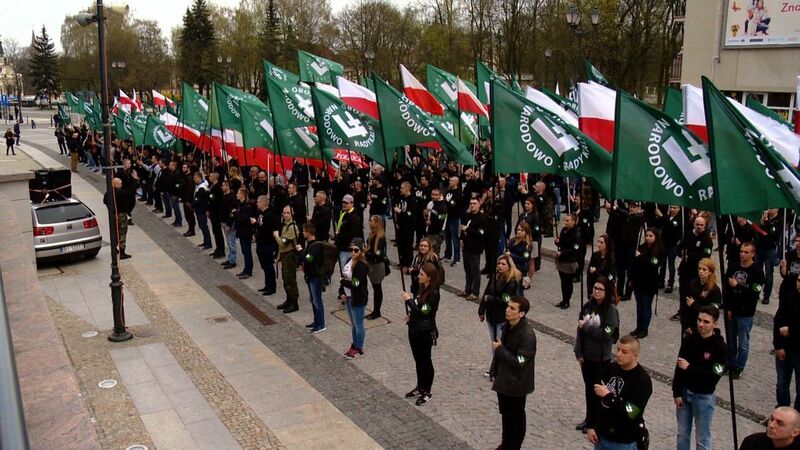 Poland too recognizes its obligation to look after the heritage of former Jewish populations of the state's territory, as do the Germans, Hungarians, Danes and many of the rest of the European countries from which the Jews have departed, why does the ACCP concentrate on only the brown-skinned countries of the Muslim world, one wonders. Could there be some bias in their summary of the issues? While Red Lists may accomplish the goal of helping law enforcement to recognize a country’s most distinctive artworks, they do not help to determine if an artwork has been stolen or illicitly trafficked – or not. Well, of course they do not. That is not at all their purpose. But they help prompt law enforcement to request what any no-questions-asked dealer dreads hearing: 'have you got any paperwork showing licit origins of that item?'. Many of them are inexplicably careless about keeping any legitimacy-affirming paperwork with the objects they bring onto the international market. It is that paperwork that determines that an object has not been stolen or illicitly trafficked (the same as the documents being carried by a brown-skinned man in Trump's America show he has the right to be in the US, if he's undocumented, he cannot stay, no?). Given that the destruction of war has been so great, and the illicit removal of cultural items so relatively sparse [...] why is the Department of State so focused on illicit trade, when a US ally is actively engaged in obliterating key monuments of Yemen’s cultural heritage? 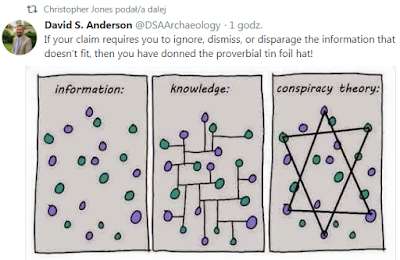 The answer to that is not any kind of anti-Jewish conspiracy, but a corollary of the manner in which the US administration is organized. Cultural property protection is accommodated as part of US 'soft power' among the diplomats of the Department of State, rather than a dedicated Ministry of Culture as in other countries (such as Yemen). In its exercise of 'hard power', the US is just as capable of blowing up old buildings as any 'brown-skinned Ayrab' regime of the Orient. The government of Yemen seems very concerned with reclaiming the heritage of its exiled peoples. Jewish (and also Christian) art, artifacts and heirlooms are included in the items covered by the Red List. Jewish religious artifacts and manuscripts are pictured and explicitly included. The Yemen Red List includes photographs of a pair of Torah finials and a Hebrew manuscript. How odd eh? Now Google "Yemeni torah" and see how many Yemeni manuscripts are currently on the market, almost all of them without any but the vaguest and apparently unsupported indication of how and when they reached the market. This is the clue to why there is concern, with a large emigre population eager to buy some tangible link to their culture (to their feeling of self ) there is a huge potential market. If the buyers restrict themselves to goods that are demonstrably of legal origin, no problem. If they stoop to buying stuff where the seller cannot demonstrate it's from a legal origin, then there is a problem. Thus since one cannot dictate what people buy on a free market, at least one can try to curb the passage of unpapered artefacts from the source countries into the market countries. Why is that so difficult for the ACCP to understand? Too many syllables in the words? Here is a before and after aerial view of the same spot. Quite tragic. Mosul is now in Iraqi hands again, and Iraqi authorities have arrested six people involved in smuggling cultural property from eastern Mosul’s Al-Karama district and seized Islamic antiquities and manuscripts. The smuggling ring had exploited ISIL's three-year occupation of Mosul to steal and smuggle antiquities (Serhad Shakir and Mohamed Waleed, 'Antiquities smuggling ring broken up in Iraq's Nineveh', English Haberleri 14th Feb. 2018). 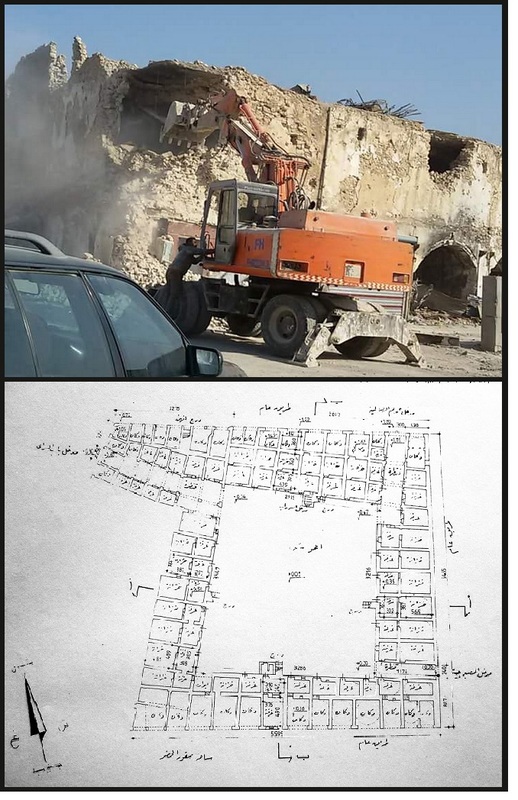 ;During this period, from about mid-2014 to mid-2017, gang members had purloined numerous antiquities from different periods of Nineveh’s history, according to [Mosul Police Lieutenant Iyad Hussein] al-Asali . “While gang members were looking for buyers, security forces raided the house they were using and arrested three of them,” he said. “Confessions later obtained from the trio allowed security forces to find and arrest the remaining three gang members, who had numerous stolen antiquities in their possession,” he added. Collectors, who did you buy those freshly-surfaced items from? This also goes for all advocates of encyclopaedic museums showcaseing global heritage for everybody in which case restricting access to certain groups totally undercuts the argument. Five members of a gang of tomb robbers in north China's Shanxi Province were sentenced to life imprisonment or death sentence with a reprieve on Sunday, the court said. 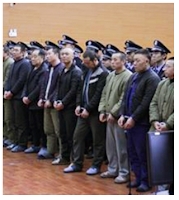 The gang of nine were found guilty of more than 74 crimes in Wenxi County of Yuncheng City since 1993, according to the verdict of Yuncheng Intermediate People's Court. The defendants, Hou Jinfa, Hou Jinhai, Zhang Chengjun and Li Jinyu, were given life sentences for crimes including organizing gang crime and gambling, tomb robbery, and illegally possession of weapons. Another defendant Zhang Baomin, was sentenced to death with a two year reprieve for crimes including illegal detention, tomb robbery and drug trafficking. The other four members of the gang were sentenced to terms of up to 20 years in prison. Collector, do you really know where those artefacts come from? 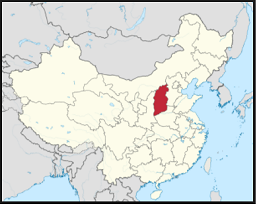 Here is the 'provenance', Shanxi, but what is their collecting history? How did the objects get on the market, who put them there? How did they leave the source country, who was involved in the 'transfer of ownership'? Only the Yemeni government is authorised to issue documents for the export and import of cultural goods, so how likely is it that collectors will be able to obtain such licences? Given the stated intent of such lists, their proliferation and their US Government funding, there needs to be far more transparency about how these lists are created, who creates them, their funding, and how they relate to US law which reserves US "independent judgment" in such matters. 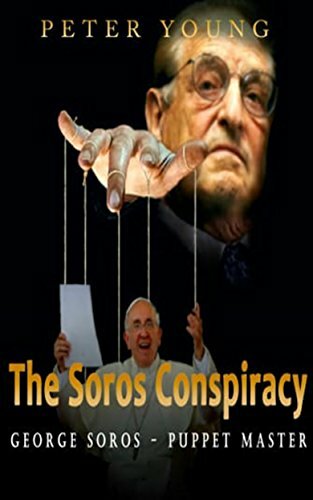 And no doubt also their connection with George Soros and International Jewry. The intent of the lists is to awaken awareness, why would that arouse the ire of anyone but crooks trying to hide the origin of the goods they handle are from? Since Mr Tompa has decided that the Red Lists are funded by the US gubn'mint, then why does he want their funding to be scrutinized? Since the 'I' in ICOM actually refers to the notion of 'international' (you know, collaborative) efforts, who actually gives a tinkers about what the US dealers and their creepy lobbyists think about this? If the US funded UNESCO, they could have a voice in the international debate, but since they do not, let them buzz off and leave the rest of us to make the decisions without them. As for the trade's 'Safe haven' red herring, if there were no dealers trying to bring paperless stuff into the US to pollute the market there with items of unproven licitness,then there would be nothing for US Customs authorities to seize and then courts to decide what to do with. the fact that these dilemmas appear are entirely due to US dealers trying to do a dirty trade in the hope that they'll not get caught out. Quite obviously what the dealers represented by Peter Tompa and the legal firm that employ him do not want being voiced is that it is the international market of artefacts from or potentially from war zones like Yemen that need to be transparent. What has the truly responsible trade to fear about that? Fortunately for artefact hunting knowledge thieves, antiquities do not bite and the tomb curses are fantasy. The remaining hazards include angry wives screaming at them for coming back home in muddy boots and the symptoms of long-term exposure to electromagnetic effects from metal detector coils. Israeli warplanes have bombed and evidently badly damaged facilities in Syria as part of their proxy war with Iran. Far from expressing outrage, the major antiquities trade lobbying groups including the ACCP, GHA and the ADCAEA have remained silent about this. But why? A cynic might think these groups are more concerned about angering the Israeli establishment than in maintaining a consistent message of apparent concern for the well-being of the poor residents of 'source countries'. After all, Israel is for dealers associated with these groups a major source of valuable artefacts with export permits from archaeological sites across the region. I posted a reply to your article a few days back regarding ASOR's report on AIN Dara, my comment was censored. 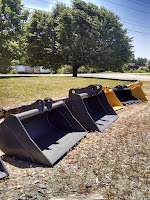 If you read the comments to my blog, I've often published contrary views. Barford too for a long time until he got out of hand. Yes, it was a glitch. Feel free to comment. Got out of hand means 'asked questions I really could not answer and exposed my bias'. That is what we called censorship in Poland, but hey, anything goes in Trump's America. CPO archaeological-lobby-silent ... Howland and I both commented on Jan 31. His is published, mine was omitted. Feb 1 comment of stoutstandards is there. For the record, I pointed out that ASOR was not silent on Ain Dara as your article implies and suggested looking for their damage report. No, not interested in restating what I've already stated above for a 3rd time. I do find it amusing though that you call Monica Hanna out for bias, ASOR and AIA out for bias, ICOM and State out for bias, but when your alliance show bias, We're supposed to believe it's a web glitch. Who would believe Peter Tompa after that? Saving Lives or Saving Stones?